Your passion for family time prompted you to organize your business around your kids, spouse, etc. You cherished the flexibility to juggle things and the freedom not to miss those important events. But is that really how it has turned out? 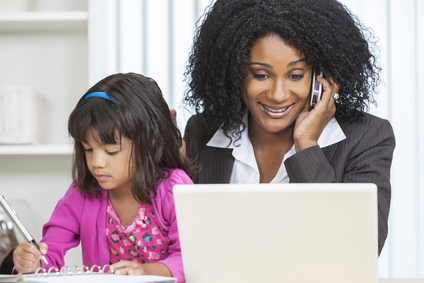 You may be like other mompreneurs I know, bothered by how preoccupied they sometimes are when with their family. You might be there in body, but often not in mind and soul. You might feel rushed and question your contribution. You may feel guilty over work undone when with family. And you may feel guilty for not spending time with family when at work. Feeling torn zaps many of the benefits you were searching for in the first place. But when your business is set up right, you CAN work reasonable hours and get good result. With your smooth-running revenue machine, you will be fully present again with family. You see, success is a simple formula: know the right things to do and do them well. Just like with the Church teachings, it really isn’t that complicated if you dig in, learn, and apply. Know who you serve and make sure they want, need, and are motivated to purchase your products and / or services. Produce / deliver your quality product in an efficient and economical way. Have a leveraged business structure where you focus on tasks that capitalize on your gifts and allow you to be the visionary, farming out other tasks..
Entrench your business and personal life with time and money saving systems to help you get more done in less time. If you need some help getting your mompreneur business set up right, I invite you to check out my special report “The Catholic Mompreneur’s Guide to 12 Things You Can Do Today to Earn More in Less Time” by signing up here.